Independent developer Intropy Games revealed today that it will launch its head-to-head puzzler Astral Breakers in the Wii U eShop this June, and genre fanatics can look forward to a featured co-op mode with unique mechanics. The main modes of Astral Breakers resemble competitive block-dropping puzzlers like Super Puzzle Fighter 2 Turbo and Puyo Puyo, challenging players to match and break long chains of puzzle pieces in order to bombard their opponents with screen-filling attacks. Intropy notes that the game's competitive element aims to capture the attention of the eSports crowd, and players can design their own attack patterns, lending an element of personalized strategy. 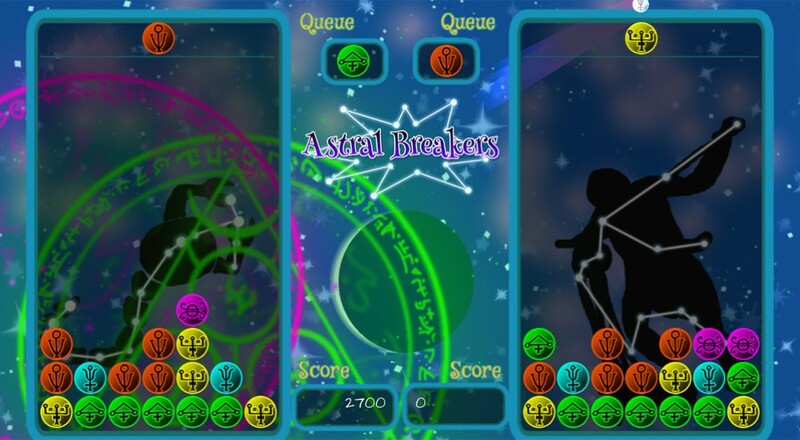 Astral Breakers also offers an alternate take on the formula with the included SuperNova mode, which pairs up a team of players and challenges them to cooperatively match as many pieces as possible to fend off attacks from an exploding star. You can get an early look at the mode in the trailer above, narrated by the husband-and-wife team at Intropy. Page created in 1.7904 seconds.